Elton John had such a run of success in the seventies, releasing some sensationally good albums. By 1978, however, punk had arrived, Glam rock had gone and he was struggling just a little to retain the huge popularity that he had a few years earlier. He was going through a bit of a troublesome time in his life too, battling with alcohol and generally annoying people who cared about him. It is, maybe, no coincidence that this was the first album not to feature Bernie Taupin as songwriter or Gus Dudgeon as producer. Gary Osborne was Elton's choice as songwriter and would continue to be so for three or four more years. While this is not a poor album, it certainly lacked a little, in comparison to many of those that had gone before. The opener "Shine On Through" is a powerful, dramatic piano-driven ballad that sounded pretty much like typical Elton, while "Return To Paradise" is a vaguely Latin-ish rhythmic and melodic number with some fetching brass and Spanish-sounding guitar and some calypso-style percussion. "I Don't Care" has a quintessential Elton John rousing piano intro and has a funked-up feel of "Philadelphia Freedom" about it. It is instantly recognisable as Elton John, so, up to now, nothing too much seems to have changed. It actually had been quite a good start to the album, if you forget the fact that, in 1978, it just didn't seem to have much contemporary relevance. 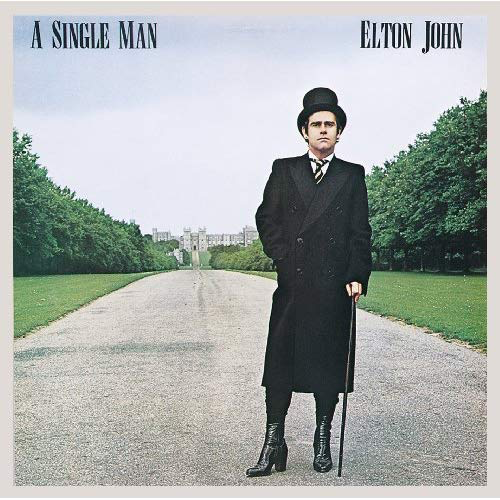 I remember listening to it at the time (my girlfriend at the time had bought it, and loved it) and, as an angry young punk, I couldn't see the point in it, but, as a lad who had been a big Elton fan in his teens I stuck with him out of loyalty and actually quite liked it. I have always had a soft spot for it ever since. "Big Dipper" sounds very much to me like something that might have been on "Don't Shoot Me" in its insistent, clunky piano. It had some catchy New Orleans-style brass backing, although the mass vocals on the chorus are a little irritating. "It Ain't Gonna Be Easy" is possibly the best track on the album - a moving, bluesy ballad with some great string orchestration, searing guitar and an impressive deep vocal from Elton. The sound quality on this remastered edition is excellent too, it has to be said. Yes, best cut on the album, for sure. The catchy "Part Time Love" was a great choice for a single. "Georgia" is a ballad at times reminiscent of the "Tumbleweed Connection" album, but it suffers, like "Big Dipper" from another of those mass choruses. It would have been much better without them and the chorus just sung straight, in my opinion. "Shooting Star" features some fetching tenor saxophone and is a pleasant ballad, with Elton singing in a strangely high-pitched style. "Madness" is an upbeat, dramatic orchestral piano rocker that allows Elton full rein to pound the ivories. "Reverie" is a short instrumental that leads into the big, evocative instrumental closer - "Song For Guy" that surely everybody knows by now. This was a good alum, actually. It was a pity that Elton's next one, "Victim Of Love", would be one of his worst ever, if not the worst.